This DC-Design modified Mahindra Bolero costs a WHOPPING Rs 17.5 lakh! Mahindra Bolero has been the most popular Utility Vehicle (UV) in India for many years now. Much of this has to do with the Bolero’s grunty motor, high ruggedness, low maintenance and affordable pricing. The Bolero is so popular that it manages to outsell many similarly priced SUVs every month. However, one simply can’t deny the utilitarian nature of this UV. The Bolero really feels very old and doesn’t seem to have any qualms about it. DC Design, however, took up the challenge of infusing a lot of desirability with this dated UV. Basically, the video we have below shows what happens to a Mahindra Bolero after going under the DC’s scalpel. There are many Mahindra Bolero owners out there who’ve tried to make their UVs look more upmarket by trying to make it look like the legendary Mercedes G-Wagen. DC’s custom Bolero, however, doesn’t want to be a G-Wagen replica and easily manages to establish its own unique identity. At the front-end of this DC-modified Bolero, you’ll find that the original grille, headlights and bumper have made way for more stylish custom units. These modifications make this Bolero look almost nothing like the regular version of this UV. When viewed front on, the DC-modified Bolero looks much more upmarket and rugged. The rectangular headlamps have made way for round ones, which are flanked by turn indicators and LED DRLs. 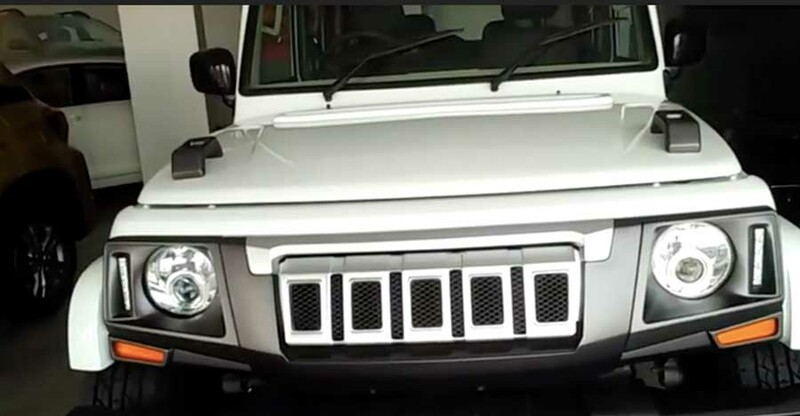 The new grille gets smaller slats. The bumper looks a lot more rugged and holds a pair of warning lights. There’s also a faux scuff plate integrated into the bumper. The hood gets a couple of handles. In the side profile, you get bolder wheel arches and a set of aftermarket multi-spoke alloy wheels. The wheel arches have been given the body colour. The ORVMs are also new and look much more upmarket than the basic units you find on the stock Bolero. The biggest highlight of this modified Mahindra Bolero, however, is the blackened-out window frame for the rear-most windows. Not only does this give the Bolero a more upmarket look but also helps it look sportier. At the rear-end, this modified Mahindra Bolero comes with custom tail-lights and a handle on each side of the tailgate. While the exterior of this modified Mahinda Bolero gets many updates to speak of, the interior remains more or less the same. True, the new leather upholstery and captain seats make the cabin a bit more upmarket, but the design of the panels doesn’t get any radical changes. We think that this DC-Design modified Mahindra Bolero looks a lot more attractive than the stock version. The design house has priced this modified Bolero at Rs 17.5 lakh, which is on the pricier side. We feel that you can get a much more modern SUV, like the Jeep Compass, for pretty much the same money. However, if you don’t want to settle for anything other than a Mahindra Bolero and also want to make it look more upmarket, you can safely opt for this mod-job.